I'm going to go out on a limb and be the first person in history to make a New Year's resolution regarding weight loss. Oh, what? Other people are doing that, too? Huh. Well, it might not be the most original resolution, but I tried to think of another way to start off 2013 in a state of abject misery that was certain to end in complete failure and thus strike another crushing blow to my self esteem, and I couldn't come up with a better guarantee for that than a diet. Oh, what? Abject misery and setting yourself up for failure aren't the point of New Year's resolutions? Huh. I thought they were. Well, I'm going to give it a try anyway. Not a real try, of course - I mean my version of trying, which is to say that I probably won't try very hard at all. As a bonus, the whole plan consists of just 5 simple steps, so we can hurry up and get to the part that comes at the very end, the part where we just give up in disgust and face-plant into a pile of Werther's Originals. Oh, what? I'm the only one who diets that way? Huh. I can hardly wait to start the self-inflicted agony and deprivation. I'll attack this plan with the same gusto I reserve for my resolutions every year, meaning I plan to stick with it for as long as it takes. Or as long as it takes me to get tired of it. Or as long as it takes me to find a bag of Doritos. well, I'm sure it burns calories, anyway. You overachievers should click it twice. Labels: #SelfShaming, development, food, humor, List Lover, That's how I see it., That's messed up., There might be something wrong with my head. This might be the first diet plan I could actually follow. Except for the bigger pants part though. Somebody keeps stealing my bigger pants and leaving behind tighter pants. Those must be the same jerks who replace all my pants! I hate those guys so much. I know, it's like the Tooth Fairy in reverse. Stupid pants swappers. Can we be like Thelma and Louise, driving our 50s era t-bird off of the cliff of rolos into the pile of werther's originals? Please say yes. Ok, ok...I'm THINKING about exercising. That's 2nd base exercising. It's as far as I go. I'm not a whore. They say that second base now qualifies as cancer treatment. That sounded a tad insensitive until I remembered that article about how groping really does reduce the risk of breast cancer (or so The Man tells us). I never really knew what the bases were, anyway, I was just going to see how far BPM would let me go. Not to brag, but, I'm excellent at visualizing a workout. I can see it all in my mind, while I lay on my sofa in my robe. It's so real that actual exercise would seem redundant. Same thing with washing dishes. Oh lord yes. Laundry undermines your confidence on a number of levels. And doctors are a total buzz kill. On a number of levels. Brilliant blog post!! I started that same diet last June--I expect to drop a pound any day now!! Patience is key - keep up the good work! Definite success coming your way! And sheer genius with the laundry--officially signing it off for 2013. I'm horrible with lists, but I think that this is a list I can actually follow. No laundry? I'm in. The nudists have it right. Agreed! I already wasn't doing laundry, but I'm happy I've finally come up with a valid (?) excuse. When you look as good as you do, you don't need to do any damn laundry. I hate it when you finish up an insult with a compliment so I can't be mad. You KNOW how I love being mad! now will i need an actual note from my Dr or can I just forge it like the anti-depressants I get from him??? loves ya girlie happy new year! Awesome, thanks! And you probably shouldn't forge a note from your doctor - you might get caught! How about I'll do yours and you do mine so the handwriting doesn't match? Just like getting your report card signed by your "parents" in middle school! Some great ideas Robyn. Someone on a motivational course once told me that imagining you do exercises actually burns up calories and tones your body. Although I have never bothered checking whether this is true or not I like to think it is. I guess if you are imagining the exercises while eating a big pile of chocolates then it works less well though. It probably does slow down the progress, but I like to believe that I'd be at least 30 lbs heavier if it weren't for my occasional "mental toning." I don't know it ISN'T true, right? 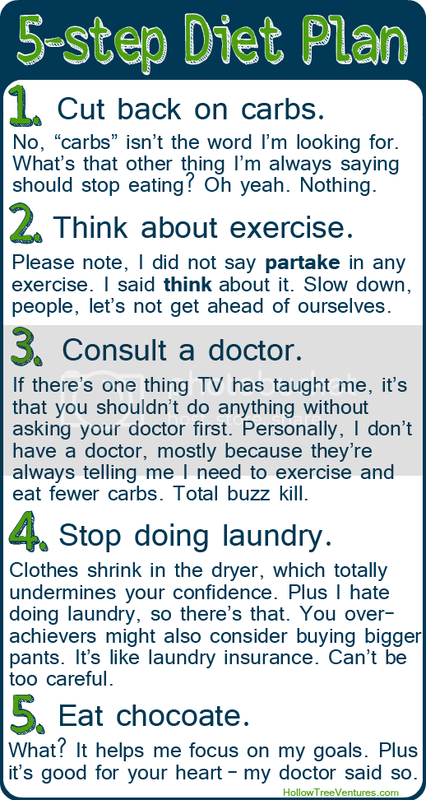 You have already done more to lose weight by writing this list than I plan to do all year. Love. Here's a realistic woman with a realistic vision for the future. Yesterday was my six week appointment after the baby was born and I was given the go-ahead to work out. Uhhh... awesome. I feel confident knowing there will never be enough time. Happy New Year! Mamas with babies and toddlers are exempt - you'll actually get a dangerous amount of exercise just chasing Mazzy around, and should consume 80% more calories to make up for the deficit. I'm surprised your doctor didn't mention it - I'm pretty sure that's what I heard my doctor say... Happy New Year to you, too! FAVE part: "Well, it might not be the most original resolution, but I tried to think of another way to start off 2013 in a state of abject misery that was certain to end in complete failure and thus strike another crushing blow to my self esteem, and I couldn't come up with a better guarantee for that than a diet." Me? I'm slain. Slain from laughing. Thanks for killing me so I don't have to log any more WeightWatchers points. Thanks, mama - I didn't even think of that benefit! I wonder how many WW points you get as credit for keeling over? Probably not enough to cover this White Russian I'm drinking - dang. this amazing site needs a lot more attention. I'll probably be back again to see more, thanks for the advice! Hi, just wanted to say, I enjoyed this blog post. It was inspiring. see the same high-grade blog posts from you in the future as well. I'm going to highly recommend this website! 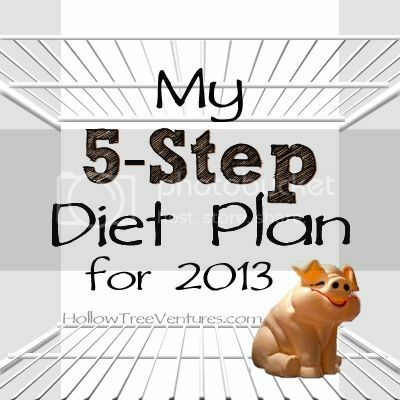 the comments on this page "My 5-Step Diet Plan For 2013". I actually do have a couple of questions for you if it's okay. Is it simply me or do some of these responses look like they are written by brain dead visitors? :-P And, if you are posting on additional online sites, I would like to follow you. Could you make a list of all of your public pages like your linkedin profile, Facebook page or twitter feed? this substance, produces the thing that is imaged by the thought. fitness center to use trainers and other staff to support and teach anyone setup your schooling routine. Who is this Somanabolic Muscle Maximizer Training Software Designed For.